There are many reasons why it is a good idea to become a CORTIME reseller. First, though many companies have seen huge savings over the years in terms of CAD and CAE, these programs still require hours of manual labour – which is both time-consuming and expensive. CORTIME reduces the need for manual labour and can run optimizations 24/7. 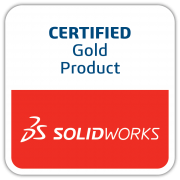 Therefore, you will be able to offer your clients a software that will make their existing SOLIDWORKS programs much more effective. Second, even though the use of CAE is growing, many companies still view simulation as a bottleneck in the development process. Since CORTIME automates design exploration and testing, companies can start simulating around the clock. Hence, CORTIME will minimize the hassle surrounding simulation, thereby making it more desirable for a larger user base. Finally, your clients are struggling every day to become more efficient and are constantly being challenged by market competitors. CORTIME will help your clients make better products, in less time, at a lower cost. In other words, with CORTIME in your selection you will provide your client with a competitive edge. So feel free to contact us, to see how you can become the next CORTIME reseller.